Beide Musiker brachen von ihrer westlichen Musikausbildung auf zu fernöstlichen Ufern. James ging nach Japan, Antony nach China. Wir leihen uns die asiatische Musik nicht aus, wir haben sie vielmehr in unser Leben integriert. So begegnen sich die japanische Shakuhachi, die chinesische Zither Quin und die europäische Klarinette auf einer Ebene, die vielleicht am ehesten als Zen-International bezeichnet werden kann. Still zieht der Mond seine Bahn bis zur Morgendämmerung. James Ashley Franklin and Antony Wheeler were trained initially in Western classical traditions and composition, and then studied in depth in diverse Asian cultures, including detailed study as performers of instruments from these cultures. This recording, Moon Road to Dawn, expresses itself through fluid interchange of tonal structures, timbral devices and performing techniques, focusing largely on the nonWestern instruments, but also incorporating clarinet and saxophone (Antony). James and Antony's use of the Chinese and Japanese traditions can be seen as taking place from a standpoint of "insiders" to the musical cultures concerned. They are not "borrowing" sounds they have heard, but rather drawing on traditions they have integrated into their musical (and personal) lives. They are bringing into contact the Asian traditions, with the intention that the encounter may prove to be an enrichment of the traditions of the instruments and their respective cultures. The performances on Moon Road to Dawn are largely based on spontaneous interaction, rather than planned structures or progressions. Guidelines are often established for these interactions, in the form of a modal area to be explored, a "feel" for a piece, or an intention to explore particular aspects of techniques for the instruments. 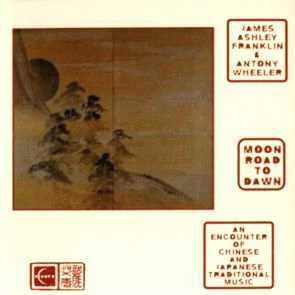 The improvisiations and compositions of these two musicians on Moon Road to Dawn deliberately explore the meeting points and differences between the traditions and instruments, drawing on elements of their Western backgrounds as well as their training in Japan (James) and China (Antony). Composer, shakuhachi performer and teacher James Ashley Franklin has developed a musical career which bridges a wide range of styles, from classical Western music to electronic music, and to traditional and modern music for the shakuhachi. James started playing piano at the age of nine; later, he studied Western art music together with ethnomusicology at the University of Sydney, and trained as a composer. His music has won numerous awards in Australia and overseas. In 1998, James was awarded the degree of PhD from the University of Sydney. Performer (clarinet, saxophone, guqin, ruan), composer, teacher Antony Wheeler was born in New Zealand and has spent most of his life in Australia, as well as a considerable number of years in Asia. He studied clarinet and composition at the Queensland Conservatorium of Music, where he also had his first contact with Chinese traditional music. He was awarded a scholarship to spend two years at the Shanghai Conservatory, studying Chinese composition. Antony then spent four years studying and teaching at the University of Hong Kong, earning a Master's Degree in composition for Chinese instruments. 1 Rising of the White Moon 5'59"
2 Echoes of Antiquity 4'36"
4 The Temple of Yesterday 6'03"
5 Reflections on the Lake 4'52"
6 Spring (Scattered Light) 6'33"
7 Dancing Ghosts by Moonlight 6'41"
8 Dialogue of the Nomads 8'13"
9 Yi Gu Ren (Remembering An Old Friend) 9'59"
10 Mind of Bamboo 4'14"
11 Kumoi Jishi (Cloud-Well Lion) 6'15"
12 Setting of the White Moon 2'53"